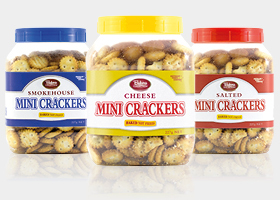 Bakers Collection® Mini Crackers are bite sized and full of flavour. Range includes: Salted, Smokehouse & Cheese 227g. 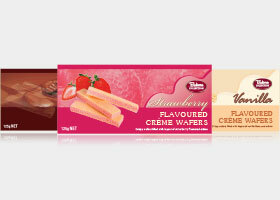 Bakers Collection® Assorted Biscuits are a true collection of familiar favourites we all love. The wide range of selection means there’s something for everyone. Stock up the home pantry or work tea room and enjoy Bakers Collection® Assorted Biscuits during morning and afternoon tea break. 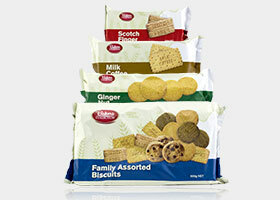 Range includes: Family Assorted 500g, Ginger Nut, Scotch Finger & Milk Coffee 250g. 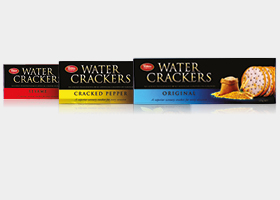 Water Crackers are light and crisp, ideal for canapés, cheeseboards and your favourite dips. each variety is carefully packed in a foil bag to retain its freshness and flavoursome taste. 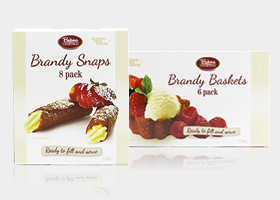 Bakers Collection® Brandy Snaps and Brandy Baskets are sweet, crisp and ready to be filled and topped with your favourite dessert fillings.